I have to keep this week’s obsessions rather short and sweet — because I’m on vacation and refuse to spend any more time online than necessary. 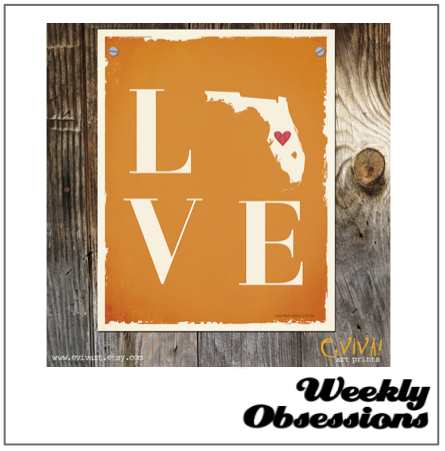 (and 2, 3 and 4) FLORIDA LOVE: I’m in Florida for a dear friend’s wedding, and the festivities begin with tonight’s Bachelorette Party. Tomorrow, we’ll lounge by the pool, and then Friday will be the big day! I couldn’t be more excited to celebrate Jamie and Chris, and I’ll get some QT in with the family. Win-win-win.